My 8 week old pet rabbit is listless, won't eat, won't drink, is poohing normal. I have taken him to vet who has given vitamin and glucose injections however there has been no improvement in last 24 hrs any thoughts. Did the vet say why your bunny was sick? I strongly suspect an imbalance in the gut bacteria. If so, the poo will deteriorate to enterotoxemia and loose diarrhea. And if so, the rabbit will be very sick, and could die. Remove ALL food from the rabbit except for grass hay. Encourage the rabbit to drink all it can. If necessary, you can flavor its water with a bit of Snapple. I hope you'll be able to save your bunny. Good luck. If your rabbit recovers, you may wish to not give it any sweet treats for a few months. No apples, no bananas, no yogurt, no sweet or colorful pet treats from the pet store. Just rabbit pellets and hay. Okay? We have been feeding him with Rabbit formula every few hours and he is inside with us and after 2 days of this he is much better. He has even eaten a little bit of Bok Choy now and grated carrot today. Im still feeding him with a syringe as well with rabbit formula in and giving him plenty of water. He is no longer just laying there lifeless he is cleaning himself now and his eyes and ears are alert, thank Goodness. His eyes look much more alert too. Excellent! Glad to hear your bunny's on the mend. Thanks for the update. Are you sure the rabbit is 8 weeks old ? A friend got a baby and the place lied about the age and the rabbit was barely old enough to be weaned. She actually got some kitten formula and put it in a bowl and the rabbit started eating like a little piggy and was ok in about 2 weeks. HAY and some oats (old fashioned oatmeal) would be the ONLY thing I would feed till it is back on all 4 paws. God BLESS and I hope it is doing better. 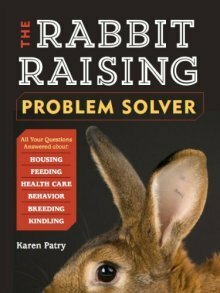 I hate having to rely on vets when they rarely know how to address rabbit issues.